One of the most highly anticipated jailbreak toolkit for iDevices, Greenpois0n has been released by the Chronic Dev Team, which p0sixninja is one of the active and prominent member for the Greenpois0n development. Greenpois0n had originally been built on SHAtter vulnerability exploit, which only support iDevices using the A4 Processor such as iPhone 4, iPod Touch 4G and iPad, and was originally scheduled to be released on October 10, 2010. However, GeoHot, the most famous iPhone hacker, released Limera1n jailbreak, which uses a different boot ROM exploit based on USB loophole. Chronic Dev Team thence delays the Greenpois0n release to implement the GeoHot’s Limera1n USB exploit instead of SHAtter, which works on more iDevices on older hardware, and is thought to already known by Apple, and will be patched in new hardware. 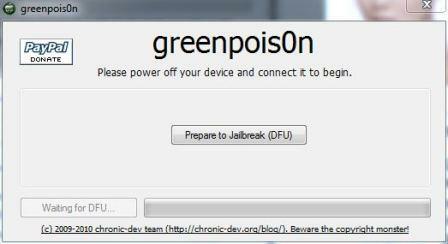 In future, Greenpois0n may be improved to also jailbreak 2nd generation of Apple TV and iPod touch. By jailbreaking the gadgets sold by Apple, the devices can load applications that is not hosted and sold on iTunes App Store, or not approved or authorized by Apple, effectively allows end-users to install and loan any apps to taking full advantage of the operating system and hardware. Greenpois0n is an untethered jailbreak, where it’s capable to executive the script on the device itself upon reboot or reset, and hence does not require the gadget to be tethered (connected) to computer for the reset operation to complete. In addition, Greepois0n jailbreak will likely to work for forever as the low-level bootrom exploit requires a revised hardware to rectify, but not through new firmware OS software (iOS). 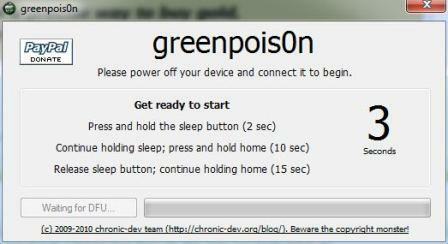 It means the current iPhone, iPod touch, iPad and Apple TV which can be jailbroken with Greenpois0n is pwned for life. Update for GreenPois0n will be posted on official website at greenpois0n.com. To jailbreak iPhone, iPod touch and iPad with GreenPois0n is an easy one click process. Note that as Greepois0n only works on iOS 4.1, all iDevices on a lower firmware (except iPhone 4) should use the TinyUmbrella to update to iOS 4.1 while preserving the baseband. Currently it’s not possible to unlock iPHone on the latest 05.14.02 / 2.10.04 basebands. Users who upgrade to latest version of baseband included in iOS 4.1 may not be able to unlock the phone again. Download Greenpois0n iOS 4.1 Jailbreak Tool. For iPhone 3Gs, iPod touch, upgrade to iOS 4.1. For iPad, upgrade to iOS 3.2.1 or iOS 3.2.2. Power off the device by pressing the Sleep button. Click on Prepare to Jailbreak (DFU) button. Continue holding Sleep button; press and hold Home button for 10 seconds. Release Sleep button; continue holding Home button for 15 seconds. Once Greepois0n detects the iDevice in DFU mode, it’s ready to jailbreak. Click on Jailbreak button to start the jailbreaking process. Note: The device may flash or display white screen during the process. Once jailbreak completed, the phone or gadget will auto restart. Click on Quit to exit Greenpois0n. Cydia is automatically installed on the jailbroken device. If not, just start “Loader” from the homescreen to install Cydia.